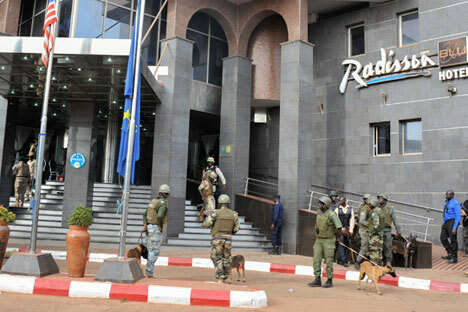 Security forces surround the Radisson Hotel during a hostage situation, Bamako, Mali, Nov. 20, 2015. RBTH presents a selection of views from leading Russian media on international events, featuring reports on the deaths of six Russian citizens in the Nov. 20 terrorist attack in Mali, changing times in the unrecognized republic of Transnistria in Moldova, and new proposals for regulating trans-border e-commerce in the Eurasian Economic Union. Nov. 23 has been declared a day of mourning in Ulyanovsk (550 miles to the east of Moscow) following the death of six employees of the local company Volga-Dnepr, who were killed in the hostage-taking attack in the capital of Mali, Bamako, reports the Moskovsky Komsomolets daily tabloid. The attack took place on Nov. 20, when armed extremists seized the Radisson Blu hotel, taking 170 people hostage. Closer to the evening of the same day, the police stormed the building. The terrorist attack claimed over 20 lives. During the police operation, the hostage takers were killed. Responsibility for the attack has been taken by a group affiliated with the Islamic State (ISIS) radical militant organization. All throughout the weekend, local residents brought flowers and candles to the Volga-Dnepr office in Ulyanovsk. The company had a team of 12 people in Mali, mainly pilots and aircraft technicians. Those who survived the attack have already returned to Ulyanovsk. This is how an eyewitness described the attack on the hotel: "The terrorists raided the hotel in the morning. Security guards tried to stop them. An exchange of fire ensued. The Russians found themselves in the line of fire. Their uniforms made them a target. The terrorists must have thought that they belonged to security agencies. That is why all six men were shot on the spot, right in the lobby together with the hotel security guards. They did not stand a chance. At the time, the remaining crew members, including the captain, were in a different part of the hotel. Having heard gunfire, they took the necessary steps to remain safe." According to preliminary reports, the bodies of the Russians will be brought home in a week's time. A parliamentary election is due to be held in the breakaway Moldovan region of Transnistria on Nov. 29, the Nezavisimaya Gazeta centrist daily reports. Many observers predict that it may mark a turning point, as a new, pro-Western regional parliament may rule to disband the unrecognized republic and rejoin Moldova, from which it has been de facto independent since 1992. Safonov points out that there are reports that the EU intends to extend the term of trade preferences for Transnistrian businesses exporting goods to the West that expire on Jan. 1. At the same time, international financial organizations plan to allocate funds to implement a series of social projects in the region. The election campaign is taking place against the backdrop of a Ukrainian blockade, which has ended the transit of Transnistrian goods. Recently, the Odessa customs authority, according to its head Yulia Murashevskaya, "has started patching up the Transnistria smuggling hole.” All this presents Transnistrian economic agents with a choice: to shut down their business or switch their registration from Transnistria to Chisinau. The Eurasian Economic Commission council is to consider a new, tougher, document intended to regulate trans-border e-commerce, the Kommersant business daily reports, citing its own sources. According to the paper, the e-commerce working group has drafted two versions of the document. The first envisages waiving customs duties on goods worth less than 22 euros and weighing under 1 kg. Parcels worth 22–150 euros and weighing 1-10 kg will incur a customs duty of 15 euros. Under the second option, goods worth under 150 euros and weighing less than 10 kg will be liable to a duty of 10 euros. If the customs value is over 150 euros and the weight is over 10 kg, the duty will be 10 euros plus 30 percent of the value. Currently, Russians can buy goods in online stores abroad worth up to 1,000 euros and weighing up to 31 kg without paying duty. According to East-West Digital News, in 2014, some 15 million Russians made at least one online purchase abroad. Nearly half of them did their online shopping in China.